Our training is focused on providing the best learning environment conducive for personal and athletic development. We've learned from experience that while team practices, camps, and clinics are important, nothing can replicate the growth that is achieved from individualized training. In a school setting, students are given many more homework assignments than tests and the philosophy behind SOAR parallels that concept. We believe players should develop their skills through training rather than the current trend of just playing game after game. How you learn can be just as important as what you learn. 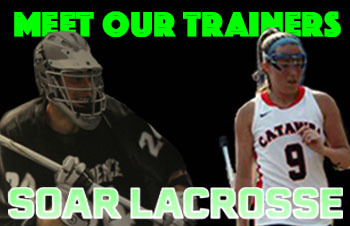 Our proven teaching methods are designed to systematically enhance our player's lacrosse IQ and skills. We focus on the intricacies of "how to" play lacrosse and maximize how our players learn by teaching skills and concepts in small manageable parts that build upon one another. We are committed to helping you grow on and off the field. Whether you're brand new, or an elite player we will help you achieve your goals and unlock your full potential. Or you can choose our book a coach option by choosing from a list of available dates & times that our trainers are currently available to train with you.